A topographic map is a two-dimensional representation of a three-dimensional land surface. Topographic maps are differentiated from other maps in that they show both the horizontal and vertical positions of the terrain. Through a combination of contour lines, colors, symbols, labels, and other graphical representations, topographic maps portray the shapes and locations of mountains, forests, rivers, lakes, cities, roads, bridges, and many other natural and man-made features. They also contain valuable reference information for surveyors and map makers, including bench marks, base lines and meridians, and magnetic declinations. Topographic maps are used by civil engineers, environmental managers, and urban planners, as well as by outdoor enthusiasts, emergency services agencies, and historians. Some of the earliest known maps were made in Mesopotamnia, in the area now known as Iraq, where a series of maps showing property boundaries were drawn in about 2400 B.C. for the purpose of land taxation. A Roman map dating from about 335-366 A.D. showed such topographical features as roads, cities, rivers, and mountains. The word topography is derived from the Greek words topos, meaning a place, and graphien, meaning to write. Thus, topography is the written, or drawn, description of a place. Although the basics of land surveying were known as early as 1200 B.C. , and perhaps even earlier, the use of surveying techniques in preparing maps was limited to cities and other small-scale areas. Larger-scale maps were prepared from sketches or journals kept by explorers and sometimes reflected more imagination than observation. As a result, the exact positions of points on a map were often grossly in error. In 1539, the Dutch mathematician and geographer Reiner Gemma Frisius described a method for surveying an area by dividing it into triangles. 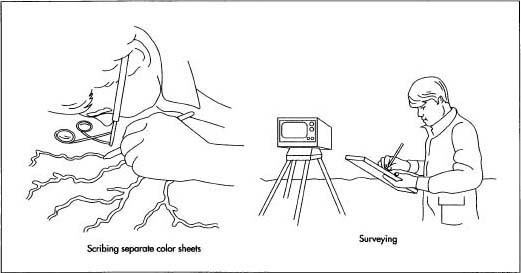 This concept of triangulation became one of the basic techniques of field surveying and is still used today. One of the first large-scale mapping projects using triangulation was started in the 1670s by Giovanni Domenico Cassini, who had been persuaded to make a detailed map of France. After Cassini's death, his children and grandchildren continued to labor on the project. The final result, called the Carte de Cassini, was published in 1793 and was the first accurate topographic map of an entire country. Its only shortcoming was the general lack of elevation measurements, other than a few spot elevations determined by measuring the variation in air pressure with altitude using a barometer. The concept of contour lines to show different elevations on a map was developed by the French engineer J.L. Dupain-Triel in 1791. Although this method allowed the accurate depiction of land contours and elevations on a flat, two-dimensional map, it was not widely used until the mid-1800s. In the United States, the federal government recognized the importance of accurate topographic maps in a rapidly growing country. In 1807, President Thomas Jefferson established the Survey of the Coast to map the Atlantic coastline as an aid to travel and commerce. In 1836, this organization was renamed the U.S. Coast Survey, and in 1878 the name changed to the U.S. Coast and Geodetic Survey. In the meantime, mapping of the interior of the country fell to a variety of individuals and organizations, including the Lewis and Clark expedition in 1804-1806, who mapped their route from St. Louis, Missouri, to the Pacific Northwest. During the period from 1838 until the outbreak of the Civil War in 1861, the Army's Corps of Topographical Engineers made major contributions in mapping the western United States, including a detailed map published in 1848 based on John Fremont's explorations. By the 1870s, so many different groups were conducting surveys that their work began to overlap. To consolidate this effort, the U.S. Geological Survey (USGS) was established in 1879. Most of the early map making was done by laborious field surveys. Starting in the 1930s, the USGS began using aerial photography techniques to produce and update maps. In the 1980s the use of computers to scan and redraw existing maps significantly reduced the time required to update maps in areas of rapid growth. Today, the USGS has more than 56,000 topographic maps of the United States in various scales, plus maps of the moon and planets. They also publish specialty maps including geologic, hydrologic, and photoimage maps for a variety of uses. In order to be useful, topographic maps must show sufficient information on a map size that is convenient to use. This is accomplished by selecting a map scale that is neither too large nor too small and by enhancing the map details through the use of symbols and colors. The most common USGS topographic map scale is 1:24,000. In this scale 1 inch on the map represents 24,000 in, or 2,000 ft. (1 cm represents 240 m) on the ground. These maps are called 7.5 minute quadrangle maps because each map covers a four-sided area on the surface of Earth that is 7.5 minutes of longitude wide and 7.5 minutes of latitude high, where 60 minutes equals one degree of angle. Because the distance between longitude lines gets narrower as you move from the equator towards the poles, the widths of the maps also vary. For maps of the United States, the maps measure about 23 in (58.4 cm) wide by 27 in (68.6 cm) high for locations below a latitude of 31 degrees and about 22 in (55.9 cm) wide by 27 in (68.6 cm high) for locations above that latitude. Other common USGS map scales are 1:63,360, 1:100,000, and 1:250,000. These scales cover larger areas than the 1:24,000 maps, but with less detail. In order to make the topographic maps easier to interpret, symbols and colors are used to represent various natural and man-made features. Some symbols are designed to look like the feature when viewed from overhead. For example, buildings are shown as solid objects in the shape of the building outline. Other symbols are universally recognized representations such as a long line with small cross marks to represent a railroad. Colors play an even more important role. Rivers, lakes, and other bodies of water are shown in blue. Forests and heavily vegetated areas are shown in green. Minor roads and highways are shown in black, while major highways are shown in red. Contour lines, which represent the shape of the ground itself, are shown in brown. Recent revisions to the map are shown in purple. The production of an accurate topographic map is a long and complex process that may take as much as five years from start to finish. It takes a skilled team of surveyors, engravers, fact checkers, printers, and others to produce a good map. Here is a typical sequence of operations used by the U.S. Geological Survey to produce a 7.5 minute quadrangle topographic map. Each section of ground is photographed from two different angles to provide a stereoscopic three-dimensional image that can be converted into contour lines. factors must also be taken into consideration. For example, in areas where there are deciduous trees, the photos are usually taken between late fall and early spring when the trees are bare and the underlying ground features are more visible. 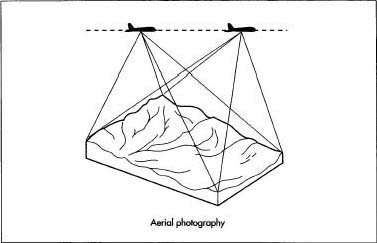 2 The aircraft is flown over the area at a constant altitude in a north-south direction along carefully determined flight paths while special cameras take 10 precisely positioned photographs of each quadrangle. Each camera can cost $250,000 or more. 3 To ensure the accuracy of a map, the exact location of various control points must be established by field surveys. Typical control points may be the intersection of two roads or other prominent features within the map area. Horizontal control points are surveyed to determine the longitude and latitude, while vertical control points are surveyed separately to determine elevations. The location and elevation of these control points help the map makers correctly position the aerial photo images and assign values to the contour lines. 4 While the surveyors are in the field, they also look for features, which may require further checking, such as roads or streams hidden beneath overhanging foliage, or buildings that may have been constructed or demolished since the aerial photographs were taken. 5 Some map features may require additional verification. For example, some streams may run only intermittently, in which case they would be represented on the map by a dash-dot or lighter-weight instead of a solid line. Certain roads may turn out to be private roads, rather than public roads, and these must be marked. Field checkers go into the area and verify these features by talking with local residents or consulting local property records. Any questionable features noted by the survey crews must also be verified. The correct spelling of place names must be determined. To ensure the accuracy of a map, the exact location of various control points must be established by field surveys. A separate scribecoat is made for each color used. moving the pointer while keeping the two beams focused in a dot, the operator traces each contour line of the ground and the location of various features. The pointer is connected to a pen on the tracing table that draws the contour or feature being traced. All contours and features are drawn in black at this point. This process is called compiling the map manuscript. 7 When the tracing is completed, the finished map manuscript is photographed, and a map-sized film negative is made. This negative is photochemically reproduced onto several thin plastic sheets coated with a soft, translucent coating called a scribecoat. 8 The plastic sheets are taken one at a time and placed on a light table, where a soft light shines up through a white plastic surface. This illumination from below makes the lines of the map manuscript visible through the scribecoat. An engraver carefully cuts away the scribecoat along the lines and areas that are to be a certain color on the finished map. For example, one sheet will have all the lines for rivers, lakes, and other bodies of water that are to be blue. This process is repeated for each color. 9 Separate sheets for the lettering are prepared by placing a clear plastic sheet over each scribed sheet and carefully aligning the lettering with the features to be labeled. Type sizes, styles, and fonts are selected according to standards, which assure consistency and legibility from one map to another. A film negative is then made of each finished type sheet. 10 After the scribed sheets are reviewed and edited several times, a color proof sheet is made by exposing each sheet under different color light to produce a color print that looks very much like the finished map. After further review and editing, the map is ready to be printed. 11 A press plate is prepared for each map color by exposing the scribed sheets and the lettering negatives. Paper is loaded into a lithographic printing press, and the first color is printed. The press plate and ink are changed and the paper is run through the press a second time to print the second color. This process is repeated until all the colors have been printed. Some of the largest presses can print up to five colors in sequence without changing plates or reloading the paper. The USGS uses the National Map Accuracy Standards set up in 1947. Starting in 1958, the USGS began testing the accuracy of their maps by field checking 20 or more well defined points on about 10% of the maps being produced each year. For a 7.5 minute map at 1:24,000 scale, the horizontal accuracy standard requires that the locations shown on the map for at least 90% of the points checked must be accurate to within 40 ft (12.2 m) of the actual locations on the ground. The vertical accuracy standard requires that the elevations shown on the map for at least 90% of the points checked must be accurate to within one half of the contour interval on the ground. For a map with 10 ft (3 m) contour intervals, this means the elevations shown on the map must be accurate to within 5 ft (1.5 m) of the actual elevations on the ground. To give you an idea of what these standards mean to map makers, the horizontal accuracy standard requires that the location of at least 90% of the check points on the map must be drawn to within 0.02 in (0.05 cm) of the correct position. Most of the topographic maps currently in use were produced manually. For mapmakers, however, the future is here today. A well-established network of navigational satellites form the basis of the Global Positioning System (GPS). This system allows field surveyors to accurately determine horizontal positions within a few feet, even in the most remote terrain where conventional surveying techniques are impossible. Other satellites carrying a variety of sensors may soon replace the aerial photography method of making maps. The first of a series of Landsat satellites was launched in 1972, and by 1984 they could detect objects on the surface of Earth about 100 ft (30 m) in size. In 1998, an American company was preparing to launch a satellite that could detect objects as small as 3 ft (1 m), which would produce images with as much detail as current USGS 7.5 minute maps. More importantly, these images would be captured and transmitted as digital data, which could then be processed and printed by computers. This would significantly reduce the time required to produce or update maps and would improve the overall accuracy as well. Thompson, Morris M. Maps for America, 3rd edition. U.S. Department of the Interior, Geological Survey National Center, 1987. Pike, Richard J. and Gail P. Thelin. "Building a Better Map." Earth (January 1992): 44-51. Wilford, John Noble. "Revolutions in Mapping." National Geographic (February 1998): 6-39. "Map Accuracy Standards." U.S. Department of the Interior, U.S. Geological Survey, July 1996. "Map Scales." U.S. Department of the Interior, U.S. Geological Survey, October 1993. "Topographic Mapping." U.S. Department of the Interior, U.S. Geological Survey. "Topographic Map Symbols." U.S. Department of the Interior, U.S. Geological Survey. U.S. Geological Survey. http://www.usgs.gov . Puzzled by the paragraph on Quality Control, seems inconsistent. It talks of horizontal accuracy to 40 feet but the end they say 2/100ths of an INCH.??!? "To give you an idea of what these standards mean to map makers, the horizontal accuracy standard requires that the location of at least 90% of the check points on the map must be drawn to within 0.02 in (0.05 cm) of the correct position."